Be reminded it was in this time frame that we uncovered he performed in Williamsport PA with this series of lecture tours. Do you guys have an exact date for that Williamsport appearance? I don't have that one. I expect it's sometime in Feb 1924 when HH was in PA.
No, the rare clipping we have from Williamsport in our collection has the date missing. He was there twice in Williamsport, in that era, we believe, and other times early on, but have no exact dates on the later ones. "Over 28 years" Plus 1895 puts it at about 1924 or later. Thanks. It's a great article. For now, I'll make an educated guess that this was during the week of Feb. 17-23, 1924 before or after his lectures in Pittsburg and Warren. I have a "[Date?]" placeholder in the chronology for now. Thanks for this, John. 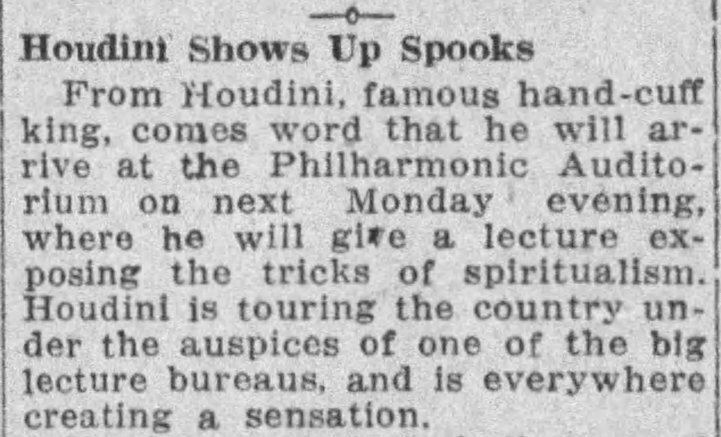 Houdini's anti-spiritualism lectures are among my greatest HH interests. Are they? Well stay tuned for a post about a review of one of his early lectures that I think you'll find interesting. Houdini's 50% cut doesn't jibe with Silverman's account that Harry did these lectures more for the public good than profit. That info comes from Christopher. It was in his contract. 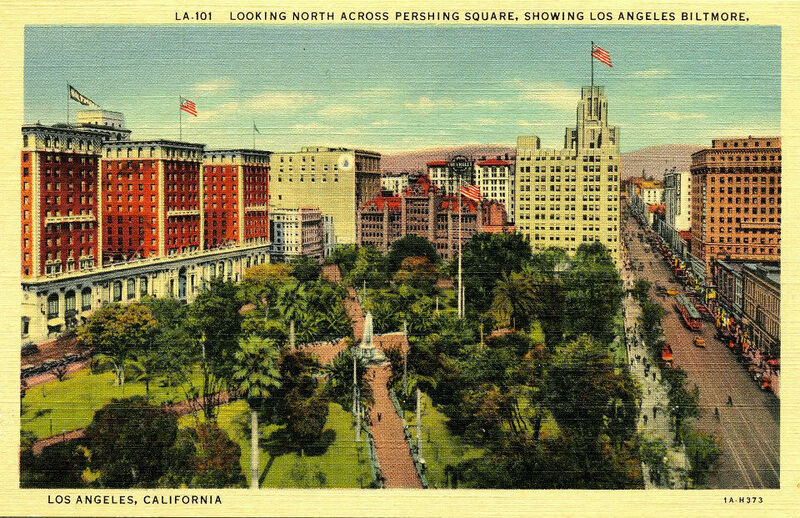 HH was paid $1,500 a week plus travel, and in 4 cites (Boston, Philadelphia, LA, SF) he received 50% of net profits. 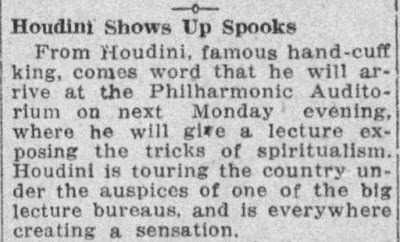 Houdini clearly did do these lectures more for the public good than profit (he would have made much more on the vaudeville circuit this year), but the tour was still negotiated and Houdini wasn't a dummy. He knew his worth.